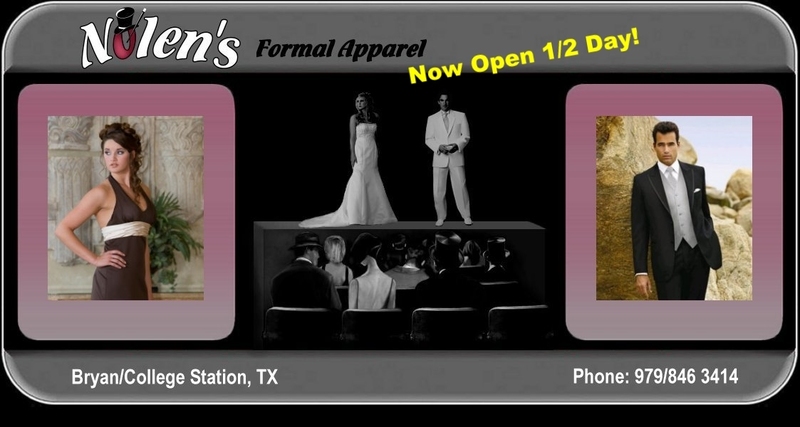 Nolen's has been providing formal wear in the Brazos Valley Texas for many years. We can help with formal wear for the next wedding, prom, quinceanera. We also serve Brazos Valley cities like Caldwell, Hearne and Navasota, TX. So, if you are looking for a tuxedo, tuxedo rental, formal wear, formal accessories, shopping for a wedding, or a quinceanera, prom, come and see us. If you live in the Brazos Valley, we are prepared to help you choose a designer tuxedo. Some of our designer names include FUBU, After Six, Jean Yves, Calvin Klein, Ralph Lauren, Perry Ellis, Oscar De La Renta, Mossy Oak and Ecko. For an out of town event, we can provide Ascot tuxedos. We are known for handling only the finest in men's formal wear. If you live in the Bryan, College Station, TX area, and are looking for the a tuxedo rental for a wedding or prom, choose Nolen's! This page originated from b8apechio.